A big question that many parents have is "Will my kids drink a green smoothie?" The answer is YES! You can make them so delicious that your kids will not even know the difference. This page is dedicated for you to show others how much your kids love green smoothies. You can even write a story on your kid's smoothie experiences! Give other parents tips on how you got your kids to drink green smoothies. You can encourage other parents to try green smoothies with their kids! I and my other readers thank you for your input! Seth and Haddie love their green smoothies! Do you have a cute picture of a green smoothie smile? Show it off here! 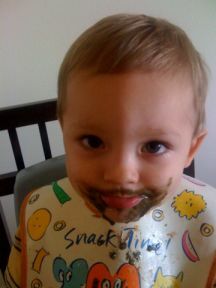 A face of a kid smothered with a smoothie is definitely a Kodak Moment!